Every year people lose fingers or an eye or even die during the clandestine manufacture or storage of explosives or because explosive materials are inadvertently produced because of improper use of chemicals. AristaTek has received requests from law enforcement officers and first responders for information on how to recognize potentially dangerous situations which may result in an explosion when conducting a raid or investigating a mysterious container. In particular, what chemicals might be used in making explosives? Who might be making explosives? The terrorist. Ammonium nitrate-fuel oil (ANFO) mixtures are a favorite of car and truck bombers. Plastic bonded explosives (such as the military C4 explosives or Semtex) are a favorite of international terrorists. Peroxide-based explosives (typically made from acetone, hydrogen peroxide, and sulfuric acid) have been used by suicide bombers in Israel , in the London bombing attack, and by shoe bomber Reed who boarded a commercial airline flight. The clandestine drug manufacturer. Cooks and others exposed to meth fumes during the manufacture of methamphetamine exhibit paranoid behavior because of changes in their brain function due to exposure to the chemicals. They may set up traps deliberately designed to injure responders conducting a raid, or become injured themselves in the manufacture of these dangerous materials. An example is triacetone peroxide (or acetone peroxide) crystals scattered on the floor at the start of a drug raid which can be detonated just by walking on the crystals. Inadvertent production of explosives or fires because of improper use of chemicals. One of the first rules taught in chemistry courses is don’t store oxidizers with flammables. Also acids and caustics should be stored separately from oxidizers and flammables. Do not mix chemicals, even waste chemicals, in these categories. In addition, certain chemicals such as those with “ether” as part of the chemical name can produce dangerous explosive peroxides upon storage over a long period of time especially in contact with trace metals (e.g. rust) which can explode by an action as simple as twisting a container cap. A common mistake is to mix swimming pool disinfectants or bleach (“the oxidizer”) with flammables such as waste solvents or motor oil (“ flammables”). The Home Depot, for example, [source: The Atlantic Journal-Constitution, November 5, 2005 Home edition, business section page 1c] experienced a number of incidents, including a $2 million fire in Quincy, Mass., in 1995 which was caused by an employee backing a forklift into a container of motor oil. The motor oil spilled and mixed with swimming pool chemicals which resulted in a fire. The toxic fumes emitted sent firefighters to the hospital. In another 2004 incident in California near the Los Angeles airport, a 55-gallon drum containing wastes collected by Home Depot exploded. No one was hurt. The drum was supposed to contain waste charcoal lighter fluid, motor oil, paint thinner, and roofing tar according to the manifest, but investigation revealed that the drum also contained swimming pool granular tablets (“the “oxidizer”). It was not clear whether Home Depot or their waste hauler mixed the chemicals, but a hazardous material specialist at the L.A. County Department criticized Home Depot’s practice of placing waste chemicals in look-alike black buckets prior to mixing in the 55-gallon drum before final disposal. Home Depot waste disposal practices resulted in a federal grand jury investigation in 2005. How Do I Know What Chemicals Should Not Be Mixed? The National Fire Protection Association (NFPA) HAZMAT diamond (NFPA 704 Hazard Classification System) provides information on flammability and whether the chemical is an oxidizer. The NFPA HAZMAT diamond for potassium permanganate is illustrated below. Potassium permanganate is an oxidizer and should not be stored near flammables. Flammables and combustibles have a 1 to 4 rating in the red diamond (4 being the most highly flammable). A rating of 1 to 4 (4 being the most reactive) in the yellow diamond is also an indicator that the chemical is reactive and could result in a fire or explosion in contact with water. The HAZMAT diamond below is for sodium metal. Sodium metal is not an oxidizer but it will react violently with water including the moisture in the air producing the highly flammable hydrogen gas. The oxidizer in this situation is the oxygen in the air. This chemical when stored should not be in contact with air or water. Chemists refer to chemicals which react with one another as oxidizing agents “the oxidizer” and reducing agents (which includes flammables). Reducing agents which react with oxygen in the air resulting in fires or explosion are called flammables. Oxygen in the air is the oxidizer. Chemicals containing chlorine as in swimming pool disinfectants are also oxidizers. Other examples of oxidizers are nitric acid, many chemicals containing nitrates, potassium permanganate, and chemicals containing chlorates. Vapor cloud explosions occur when a flammable liquid vaporizes or a combustible solid forms fine particulates in the air. The particulates or vapor or aerosol is in contact with the oxygen in the air. An ignition source can set off a vapor cloud explosion. Chemicals containing both oxidizing and reducing parts in the same molecule (i.e., the same chemical) are called explosives. Depending upon the chemical, the explosive energy can be released by friction, shock, heat or another explosive called a primer. If there is enough oxidant present, oxygen in the air is not necessary for the explosion to occur. A list of homemade explosives and the chemicals used to manufacture them is presented in Table 1. Product may be mixed with ethylene glycol dinitrate and stored chilled until ready to use. Glycerin is slowly added to a 50:50 mix of concentrated nitric and sulfuric acid under controlled temperature conditions; wash with sodium bicarbonate solution. Potassium nitrate may be used instead of nitric acid. Commercial ammonium nitrate prills used for blasting have a 20% void space and are coated with #2 fuel oil or kerosene at the job site; homemade bombs made from ammonium nitrate fertilizer do not have the void space and are less efficient. Sulfur; chlorine (generated from bleach or swimming pool chemicals); hydrochloric acid; oil; sodium chloride; manganese dioxide; benzene; anhydrous ammonia. Source: U.S. government Hazardous Substance Data Base at http://toxnet.nlm.nih.gov/cgi-bin/sis/htmlgen?HSDB. Also http:www.fortliberty.org/military-library/Improvised_Primary_Explosives.pdf. Some of these explosives are used commercially; others are not. There are several other home made explosives that can be put together but require more difficult-to-obtain raw materials. Detailed recipes for making these explosives may be found on the Internet. All of these recipes have varying degrees of risk during the manufacture of these explosives. The backyard chemist can easily lose an eye or hand or be killed. Many of the explosives produced are unstable and can easily detonate. Meth cooks and others exposed to methamphetamine and other chemical fumes tend to become paranoid because of changes in their brain chemistry. Safety with respect to using chemicals eludes them. The meth cook may set up a trap designed to maim or kill law enforcement officers performing a drug lab raid. The explosive material may be manufactured by the lab along with the illegal drug and spread around just before a drug raid. Some of the same chemicals used to manufacturer meth can be also used to manufacture explosive materials by adding another ingredient. Chlorate impact explosive. Meth manufactured by the “red phosphorous method” already has red phosphorous which has probably been obtained from match sticks or highway flares. If the red phosphorous is mixed with potassium chlorate to which a small amount of sulfur is added, a dangerous explosive is formed. The potassium chlorate is first ground and mixed with a small amount of sulfur and then mixed with water. Red phosphorous is then added. When the mixture dries, it is extremely shock sensitive. Sodium chlorate might be used instead of potassium chlorate. Drug raid tip-off: red phosphorous filter stains from meth manufacturing, and/or broken match sticks/flares; sulfur; any chemical containing chlorates such as potassium chlorate; suspicious powders or crystals scattered about the floor or at various locations. Nitrogen triiodide. Ammonium hydroxide (ammonia water) is added to iodine crystals and allowed to react. The nitrogen triiodide crystals are allowed to form and settle. 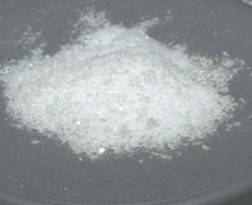 Iodine crystals is also an ingredient in meth manufacture by the red phosphorous method. The nitrogen triiodide crystals when dried are extremely shock sensitive Even sunlight or the slightest shock may set it off. The crystals might be dispersed wet and allowed to dry at the time of the raid. Nitrogen trichloride. There are several ways of manufacturing this dangerous compound. Ammonium hydroxide or anhydrous ammonia which is also used to manufacture meth is a starting material for this explosive. One method is to place a saturated ammonium chloride solution in an ice bath and connect two carbon or lead rods (from a battery) placed in the solution to a battery charger. The nitrogen trichloride forms as a yellow oil under electrolysis of this solution. Another method is to slowly bubble chlorine (generated from a bleach solution or swimming pool chemicals) into a ammonium nitrate or ammonium sulfate fertilizer. The final yellow oil is highly unstable and can explode on contact with almost any organic material or if heated. It is very shock sensitive. Drug raid tip-off: Fertilizers with high ammonium contact; or ammonium hydroxide; hydrochloric acid; battery charger; chlorine/ammonia odors; yellow oil. Acetone peroxide. Also called triacetone peroxide, tricycloacetone peroxide, or TATP. There are three forms of acetone peroxide with varying degrees of stability depending how it is made. When it explodes almost all of the energy is directed towards the blast and very little appears as heat. The explosive power is similar to TNT on a mass basis. Basically, a solution of 30% hydrogen peroxide is mixed with acetone and cooled to 5oC. A small amount of sulfuric acid (Sp. Grav. 1.84) is added while stirring. The mixture is allowed to sit, allowing acetone peroxide crystals to settle out. The crystals are filtered and washed with water or a baking soda solution. This procedure should produce mostly the cyclic form (tricycloacetone peroxide). The material has a shelf life of about 10 days. Its half life is about a month or two. A more dilute solution of hydrogen peroxide (e.g. 3%) or battery acid may be used but yields will be much less, and the monomeric form of the explosive will dominate. If the reaction is above 10oC, the unstable dicycloacetone peroxide will be formed (which can spontaneously explode). There are procedures available on the Internet for concentrating the hydrogen peroxide. Battery acid can be concentrated by boiling until white fumes begin to occur. At least 2 grams of the material must be present for acetone peroxide to detonate in an unconfined space, but someone walking on a crystals spilled on the floor can still be injured. One crystal decomposing violently can set off all the others on the floor. Trace amounts of metals (rust, iron, copper, etc. can cause the hydrogen peroxide to decompose violently. The shelf life of the explosive may be extended by dissolving in an organic solvent. If stored in a container with a screw cap, unscrewing the cap can cause the peroxide crystals to detonate. More technical details in Journal of the American Chemical Society volume 81, page 6261 ff, (1959). Drug raid tip-off: Acetone, sulfuric acid or battery acid, and/or hydrochloric acid are commonly found at meth labs. The tip-off is also finding hydrogen peroxide, especially the more concentrated solution. Methyl ethyl ketone peroxide. Similar to hydrogen peroxide except methyl ethyl ketone is used instead of acetone. If any oxidizers are seen during a meth lab raid, the possibility that explosive materials are also being produced should be seriously considered. HMTD. Also called Hexamethylenetriperoxidediamine. The raw ingredients are 27 or 30% hydrogen peroxide, powdered hexamine, and citric acid. The hexamine might be obtained from an army surplus stores as a solid fuel tablet used for outdoor camping, and might go by the name “urotropine’ or “hexamethylenetetramine”. Citric acid might be obtained from a food or drug store. The hexamine is crushed, mixed in with the hydrogen peroxide solution, and citric acid added while keeping the temperature below 10 C. The precipitate formed is filtered, washed, and allowed to dry. The dried precipitate is extremely shock sensitive and can detonate even in sunlight. The moist crystals might be spread around just before a drug raid. [see http://pyroteknix.freespaces.com/hmtd.htm ]. Drug raid tip-off: army surplus hexamine fuel tablets, hydrogen peroxide (might be sold as hair bleach), citric acid (might be sold as sour salt). Pipe bomb. Black powder is a favorite of pipe bomb users. Ingredients of black powder include charcoal, powdered sulfur, and potassium nitrate (sodium nitrate might be substituted). Alcohol (rubbing alcohol) might also be used in the manufacture. Acetone peroxide (left) is a white, crystalline powder with a distinctive acrid odor. Three forms are commonly formed, the monomer, dimer, and trimer. The recipe described above (use concentrated chemicals, 5oC) favors the trimer form, also called tricyclic acetone peroxide, or TCAP). The other forms are less stable. TCAP will slowly sublime at room temperature. All forms are shock sensitive. Of course, many of the chemicals which can also be used to make home-made explosives are found in ordinary homes. They are used for legitimate purposes such as furniture restoration, as disinfectants, scale removers, automotive finish restoration projects, solvents for brush cleaning and varnish thinners.